Time for Seasonal Clif Iced Gingerbread bars! It’s that time of the year when Clif comes out with their seasonal Sustained Energy bars. This year, they are bringing back our favorite Iced Gingerbread! They actually added a new Seasonal flavor this year, Peppermint Stick… which sounds good too! The other seasonal flavor, Spiced Pumpkin Pie, makes a return with the Iced Gingerbread. Being seasonal means not all stores will carry them and those that do will only be for the next couple months. 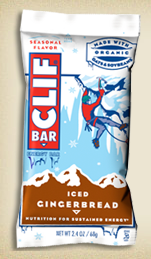 If you can’t find the Iced Gingerbread local to you, Clif sells on their Web site too. The 3 special flavors join the normal lineup of 16 year round Clif choices.